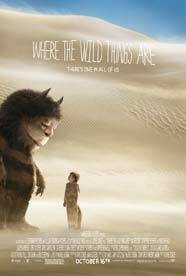 Where the Wild Things Are is an exciting and vigorous adaptation of the seminal book by Maurice Sendak. Unlike most film versions of literary material, there are few subplots to alter or characters to drop. One of the most engaging things about the book is the power of its simplicity. There is little that could be subtracted from the story without harming the narrative. The question of adaptation becomes: how do you keep the spirit alive while expanding the narrative to fit the necessary screen time? Director Spike Jonze (Being John Malkovich, Adaptation) has added his own signature to the story and created a remarkable cinematic equivalent to the book, expanding the adventure in a strange world in ways that feel both familiar and at times unexpected. Jonze, who has said that it took him years to discover a way to bring the story to the screen, has found the key to adaptation in the action-oriented personality of young Max. Adding a framing story that involves an ice igloo to Max’s waking life, he creates a parallel event on the island that develops into an elaborate extension of Max’s keen imagination. The result is a tale that might have existed between the original pages of Sendak’s slim and engaging book, if he had elaborated further upon his own creation. Played with authority by first-time actor Max Records, Max is a startling bundle of youthful aggression and determined adventurism. From the opening sequence we sense that he has more energy pounding inside him than can be controlled. Pursued by a frantic hand-held camera down a wooden staircase, clutching a very disturbing fork, he races in full flight after a terrified gray poodle, wrestles the animal to the floor, and lets out a loud animal roar. Max arrives fully formed – a screaming ball of fury. Catherine Keener plays Max’s mom with a combination of vulnerability and determination that is truly remarkable. Struggling with work and the promise of a new relationship, even she has to throw up her arms when Max, in his wolf suit, wrestles her to the ground and sinks his teeth into her shoulder. The heart of the film is the journey that Max takes into his own imagination. Unlike the bedroom/jungle transformation in Sendak’s book, Jonze releases Max into the streets as though he were a beast propelled from a cage. He flees his home with abandon, finally commandeering a small sailboat that takes him on an overnight journey to the mysterious island where the wild creatures live. Sendak’s characters, voiced by a cast that includes James Gandolfini (Carol), Catherine O’Hara, and Forest Whitaker, come alive in a nighttime encounter. Max confronts Carol, the big furry alpha male who parallels his own aggression and insecurities, and is recognized as a similar soul. The integration of physical puppets, animated by the actors working inside them (designed by the Jim Henson group), and 3D animation is subtle and blends seamlessly. Max’s “friends” are big, live versions of Sendak’s creations, with grace and tons of personality. The music, composed by Carter Burwell and Nancy O., is youthful, upbeat, and infectious, and works brilliantly with the brisk but carefully paced editing. Jonze has created fully developed characters with their own mannerisms, physical characteristics, and ability/desire to verbalize. The much-expanded dialogue, designed to individualize the characters, might cause unease for some who have truly internalized the book. When you read Where The Wild Things Are, the large detailed drawings and spare narrative encourage you linger on each page, to meditate on form and meaning, to add your own sounds and action to each frame. But the process of adaptation means that the imagined must somehow become concrete. Where The Wild Things Are is a joyful and serious reflection on childhood dreams that exists somewhere between the innocence of youth and the awakening of adulthood. It’s an honest and emotionally engaging adaptation of a truly influential work of art. This entry was posted in Film Reviews and tagged Maurice Sendak, Spike Jonze, Thomas W. Campbell, Where the Wild Things Are by Thomas W. Campbell. Bookmark the permalink.